What is The Automatic Museum Guide? 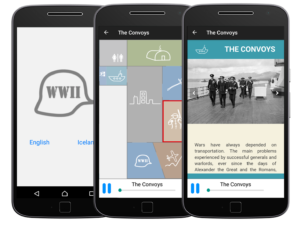 The Automatic Museum Guide is a revolutionary technology for museums that empowers curators to create immersive multimedia experiences and engage visitors through narration and guidance. The app allows visitors to explore exhibits, with audio and other content being triggered automatically as they move through the museum. With the Automatic Museum Guide visitors get an unforgettable and rich experience, and museum curators are empowered through content control and a better understanding of visitor behaviour. The user selects their desired language from the home page and the app displays a venue floor map, exhibits and user location (if this mode is chosen). The app detects where a visitor is located and when the visitor approaches exhibits, the app automatically plays a corresponding guide in the form of audio, video, text or HTML content. The app can be downloaded and used on a visitor’s personal mobile device or devices provided by the museum. Get Your Own Branded App! Enhance your Museum experience and increase brand visibility and engagement with your own branded app. Upload your logo, graphics and content and manage your own in-app content. You have complete control over the content which can be added, changed or removed in the Creator CMS at any time. Everybody can create and test their own limited indoor tours and games in the Locatify Creator CMS and generic TurfHunt test-app free of charge. Simply sign up for Locatify Creator CMS and download the TurfHunt app to Android or iOS. For indoor tours and games you will need a venue floor map and your own beacons. Indoor Activation and Venue: To determine the visitors location indoors we use industry standard Bluetooth Low Energy (BLE) Beacons and cutting edge Ultra-Wideband (UWB). BLE iBeacons: Are most suitable for museums which require precision of 2.5m positioning accuracy. BLE iBeacons are attached to specific locations throughout the venue and connect with mobile devices to communicate the users location or proximity to a specific location and to trigger content. iBeacons can be used both indoors and outdoors and can be battery or USB powered. Installation is quick, and requires minimal maintenance. Ultra-Wideband (UWB): Provides much more precision compared with iBeacons. UWB provides positioning data with 20cm accuracy in a 3D space) and positioning updates every 100ms. Ultra-Wideband Anchors are placed in the corners of a room and guests are provided a UWB locator tag (Wristband, Lanyard or attached to devices). When guests move through the museum their eacct location is tracked and is used to trigger content at the right time and place. Anchors are easily installed in less than 1 hour and require minimal maintenance. Anchors can be battery powered, USB powered or PoE. Which technology is most suitable: This depends on the accuracy required of the location technology, the layout of your museum and the need to equip guests with a UWB locator tag. BLE Beacons are best suited for smaller rooms or proximity based content triggering where 2.5m accuracy is acceptable. UWB is suitable where high precision is required or the museum has large open spaces. Both technologies can be combined to cover complex exhibition spaces. These video tutorials show how to create an indoor guided tour in the Creator CMS and how to export it to the generic-test app.